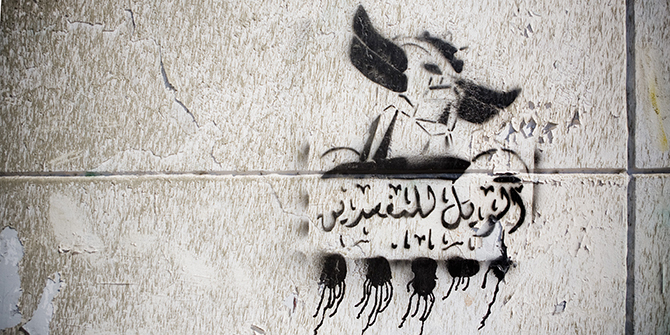 Graffiti in Tahrir Square, depicting Grendizer, with a warning to corrupt officials © Hossam el-Hamalawy. It is not often that academic research allows for the critical examination of one’s own childhood memories. However, in an article I recently published, I did just that! I explored renewed public engagement with cartoons I watched as a child. The article, ‘Grendizer Leaves for Sweden: Japanese Anime Nostalgia on Syrian Social Media’, was published in the Middle East Journal of Culture and Communication earlier this year. The article explores nostalgic videos and memes inspired by Arabic-dubbed Japanese anime series originally broadcast on Arab TV stations in the 1980s. As part of a dissident social media culture, amateur videos that redubbed and edited childhood cartoons have appeared on YouTube since 2011 tackling themes of revolution, war and exile. These videos playfully reflect affective positions ranging from anti-authoritarianism and anti-terrorism to the pains of longing for home. The recycled YouTube videos, I argue, are part of empowering media practices in the way they project political meaning onto childhood cartoons. In the article, I analyse the Syrian re-appropriation of Arabic-dubbed Japanese anime by offering a typology of nostalgic online practices in the contexts of the uprising and the war. These media practices can be grouped into three categories of nostalgic mediation: nostalgic defiance, as expressed in calls for political action; nostalgic mockery, as reflected in subversive nostalgic humour targeting authority; and nostalgic anguish, in reaction to the trauma of war and exile, particularly in relation to the Syrian refugee crisis. I found this YouTube phenomenon fascinating because it is not always apparent that one’s individual memories and nostalgic longings are actually shared by many others. It is through the expression of intimate memories that a sense of a generational identity materialises and an emotional bond between strangers is fortified. In certain situations, such as political crises, economic shifts, revolutions and wars, this bond is mobilised in collective political action. Within such contexts, childhood cartoons offer a convenient and accessible source of inspiration for reclaiming identity by adults. Childhood cartoons proved to be a familiar and intimate source of expression of a generational identity and memory, particularly as they were originally broadcast on TV within defined ‘children segments’, which meant they were watched by the young target audience at the same time on the same channel. Nostalgia towards these cartoons surpasses their content as it also includes a yearning for a lost family life and childhood sociability. The cartoon series also offer simplistic narratives about good versus evil, where the good always triumphs. Their plots lend themselves well to activism and revolutionary action, which rely on the idea that sacrifices are necessary for the greater good to prevail. In the case of the Arab world, I note that the original cartoons as dubbed from Japanese already reflected a particular political culture. Some anime opening jingles, such as the Ninja boy Sasuke, referred to the importance of patriotic sacrifice, national unity and themes about foreign occupation. The beginning of the Arabic jingle translates to: Rise up, put your hand in my hand, rise up to defend your tomorrow and mine; we shall defend our land; with our blood we shall defend it. This original political and cultural Arabisation of the cartoons is another reason why they acquired a second life when new political circumstances presented themselves and when social media and digital technologies allowed now-adults to engage in different kinds of communicative practices. I am stuck at sea between Turkey and Greece. I want to seek asylum. The war in Syria has not ended yet… You know Jim, even if I reach Sweden; life is going to be miserable and void of meaning. I will live in a country that is not my own. I will yearn for Syria. These clips begin to reflect the overlooked sense of exile felt by Syrians. Unable to bring with them cherished physical objects from Syria, digital practices seem to have offered one way for self-expression. Reclaiming memories on YouTube is an ephemeral yet powerful way to maintain a sense of cultural continuity and to keep alive collective memories, given the extreme circumstances of exile and war that Syrians have found themselves facing. 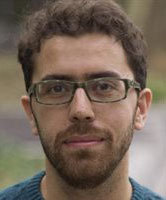 Omar Al-Ghazzi is Assistant Professor in the Department of Media and Communications at LSE. His expertise is in global communication and comparative journalism, with a focus on political contention, digital activism and collective memory in the Middle East and North Africa. Omar tweets at @omar_alghazzi.